Do you know that more than 37.7 million Indians are affected by water-borne diseases annually and 1.5 million children are estimated to die of diarrhea? 45% of India’s children are underdeveloped and 600,000 children under five die each year because of water-borne diseases. Therefore, it is a must to conduct a regular inspection at municipal schools to inspect that whether the RO of the school is clean or not. Whether the toilets of schools are clean or not. Is there water facility available in the school? All these inspections at municipal schools and residential areas play an important role in reducing such diseases among children. Thus, Everythingcivic.com has developed the government health Inspection mobile application VBD-Tracker, allowing the officials of the Commissionarate of Health service to regulate and ensure compliance, perform regular inspection and implement all the activities to prevent and control water-borne and other diseases. In order to monitor such types of diseases at State or National Level, the application has digitalized the whole process of inspecting, reporting and preventing activities. Till date, the government departments are managing and processing all the reports, activities manually and it delays in compiling the reports at the state level and chances of increasing such diseases augment. Our developed VBD-Tracker, a feature-rich mobile solution, allows the Health Service Department to regulate the monitoring mechanism using smartphones and modern web browsers on desktop computers. It will make use of Internet to bring the field staff and back office admin members closer and reduce the gap of communication and duplication of work. The app will use Internet/3G data feature that will act as a sensor to transmit the data to the central server. The best feature of it is that when there is no Internet connectivity, all the reports that you are updating will be stored locally on smartphone and then it will sync/upload once you get the connectivity. It is the most useful feature when the inspectors are inspecting in villages or forest areas. VBD-Tracker will also get the actual Global Positioning System (GPS) location of the person, who is on the inspection field. The application allows the system to capture the actual and real-time location, including latitude and longitude. It ensures that the officer or inspector has actually visited the inspection place or location and performed his duties accurately. The report will be saved permanently in the application, so officers can confirm it whenever he wants and recheck it as well. There is one famous quote “picture speaks a thousand words”. Therefore, the application allows users to use the camera as a sensor on smartphones. Users are able to click the photo of the actual site, which they have visited. Photos of the spot or inspection site play a very significant role in your reporting as it gives a real view of the spot or site that visited by officers. VBD-Tracker for schools is an advanced module of the application, allowing health inspectors to inspect municipal schools and create health inspection reports with detail information like picture of the RO tank, toilets and other dirty area of the school. 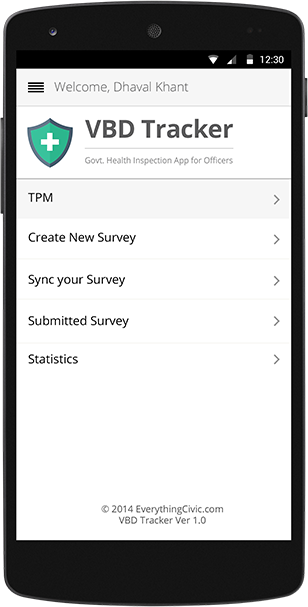 VBD-Tracker for officers is another module of the application, enabling senior health officers to check submitted health inspection reports with detail information. Using this module, the officers can track and monitor all the municipal schools of the city. The CRM solution is obtainable for senior health officers and principles of the schools. It allows senior health officers to check all the reports that submitted by health inspectors. Moreover, principles can create the school profile and maintain it. They can also edit the school information if needed.